Apparently the Archbishop of Canterbury has said the EU is the greatest thing since sliced bread. Actually, he said it’s the greatest thing since way before sliced bread: “The EU has been the greatest dream realised for human beings since the fall of the Western Roman Empire,” he told the Assembly of the Conference of European Churches in Serbia. The Romans didn’t have sliced bread, and the Western Empire finally fell in AD 476 after a long period of decline. What with roads, aqueducts, underfloor heating, concrete and the calendar, they never got round to inventing sliced bread, but they probably would have done if their empire had lasted a bit longer. 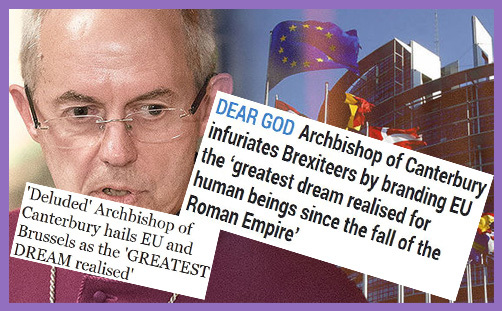 That aside, Justin Welby believes the EU to be the greatest dream realised for human beings for the past 1542 years, which is a vast epoch over the jiffy we’ve had sliced bread. It’s a great pity that this acutely political (and manifestly [purposely?] divisive) line was included in this speech, because the theme was ‘Christian Presence and Witness in Europe’, and the rest of it is sound spiritual stuff. But someone should have known that lauding the political construct of the EU as “the greatest dream realised for human beings since the fall of the Western Roman Empire” would drown out everything else he said about the labours of the Church in witness through persecution, endurance and reconciliation. The Prince of Peace doesn’t get much of a look-in when you proclaim the EU to be a greater dream than the Enlightenment and better than eternal salvation. But the curious thing is that it’s the Council of Europe which the Archbishop ought to be lauding: its nations came together in 1949 – almost a decade before the EEC (now EU) – to work for peace and reconciliation, establish human rights and foster democracy and the rule of law. The Council of Europe now includes 47 nations and 820 million people, which is 19 (soon to be 20) more nations and 300 million (soon to be 365 million) people more people than the EU. The UK isn’t leaving the Council of Europe: we helped to forge its ethos and shape its essential Christian mission. It was Winston Churchill who dared to “peer through the mists of the future to the end of the war”, and imagine a body of sovereign European nations working together for the common good. It is the fraternal and benevolent Council of Europe which united the Continent and “brought peace, prosperity, compassion for the poor and weak”; not the EU, as the Archbishop believes. Oh, the EU might have purloined the Council of Europe’s flag and anthem and, indeed, have established something called the European Council so that people will forever be confused by the myriad of similar labels applied to a labyrinth of bodies which appropriate the word ‘European’. But the Council of Europe is distinct from the European Union: it was the true midwife of peace and godfather of reconciliation. Why does the Archbishop of Canterbury not know this? If he does know it, why didn’t he say it? Why attribute the pursuit of harmony and cooperation, and the codification of fundamental human rights and freedoms, to the bureaucratic oligarchical construct known as the EU, rather than to the fraternal democratic creation known as the Council of Europe? 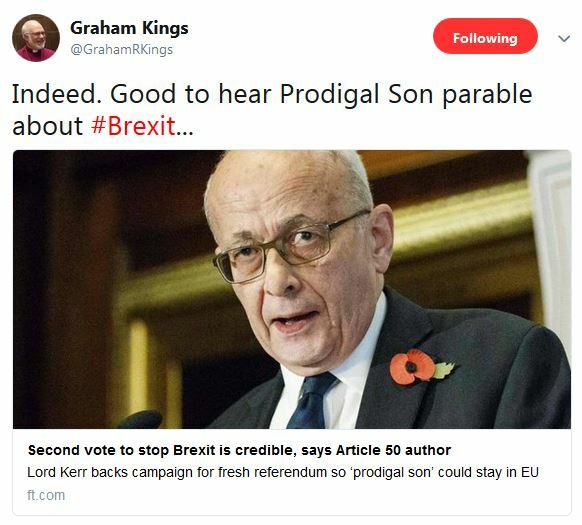 The UK is not the Prodigal Son: it is more perhaps that the EU is the elder son – sanctimonious, self-righteous, jealous, judgmentally superior and smug. You don’t foster reconciliation by proclaiming partisan hyperbole. You can’t on the one hand preach that Brexit offers “great hope and opportunity“, and then deride Britons for turning their backs on God’s sacred plan for Europe to bring hope “for all its people”. We are left with the impression that the Church of England is a liberal, left-wing body of Remainers whose mission it is to save conservative, right-wing Brexiteers from their sins of rebellion and political heresy. Where’s the pursuit of the common good in that?